Beautiful oval rainforest jasper beads are left to shine alone in these simple earrings. 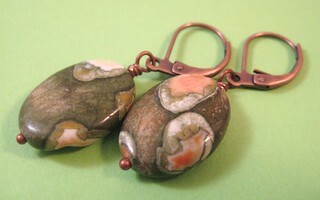 I love the colour in these earrings - a great forest green complimented with peach and cream. They're paired with antiqued copper kidney wires - the perfect touch!